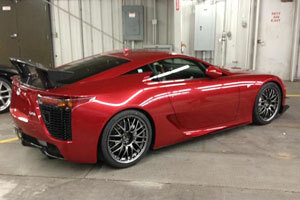 The latest Lexus LFA Nürburgring Edition to reach the USA is a beautiful Pearl Red with a red & black interior — Lexus has posted a photo gallery over on Facebook that shows the supercar in more detail. Johndeere7920p: in my home town of omaha nebraska!!!!!!!!!!! !